Here’s a perfect easy-to-make and feel-good dessert for home-based entrepreneurs. Learn how to make fruit salad. <>Fruit salad is one of the most common desserts served during Christmas Eve, New Year’s Eve and other occasions like fiestas and birthday parties. 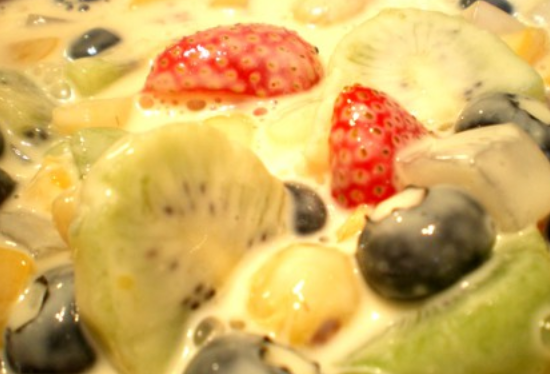 This side dish made from an assortment of fruits is topped with cream and condensed milk. Locally, canned fruit cocktails are the main ingredients of this delicious treat. This dessert doesn’t spoil easily if stored in a chiller or freezer. It is very easy to make–all you need is a mixing bowl, a spatula or a mixing spoon, and a container. It is also easy to sell, especially this Yuletide season. You can buy fruits and canned cocktails in the nearest marketplace or grocery. Aside from the typical ingredients, you are free to experiment with other fruit combinations. The recipe below can make 12-15 servings. Here’s how to prepare the Filipino fruit salad. 1. Before slicing the fruits, make sure to clean them thoroughly by washing them with water. Open the cans of fruit cocktail and drain syrup or juice. Combine all fruit ingredients (including nata de coco) in a bowl. 2. Pour the condensed milk into the bowl and mix thoroughly. Next, add the all-purpose cream and continue mixing until milk and cream are evenly distributed. 3. Let it chill in the refrigerator or freezer for at least three to four hours before serving or selling.